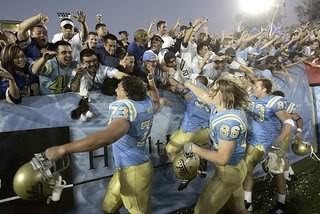 I'm an alumnus of UCLA, so I thought I'd share my excitement over the UCLA Bruins upsetting USC today at the 75th annual meeting of the two teams' football programs (usually the last game of the season for both teams). The UCLA-USC football game in Los Angeles--the only crosstown city college rivalry in the country--is always big locally, but what made this win especially sweet was that the Bruins not only got to finally snap a 7-game losing streak against the Trojans (after themselves beating 'SC a record 8 games in a row), but did so in a game with nationwide implications. Going into the game, USC was ranked second in the nation, was favored by 12 points to beat UCLA, and with the win was expected to play for the national championship, their fourth shot in five years. Instead, unranked UCLA played the spoiler, upsetting USC 13-9, thus ending the Trojans' national championship hopes. This also was the first time in 63 games (an NCAA record) that USC has scored less than 20 points. The score clearly shows that what won the day was the UCLA defense. With all due respect, USC deserves all it has earned in the last several years as one of the finest football programs in the country. Which makes this victory all the sweeter.